The remains of Ronny Mora’s car after it caught fire on LIRR tracks in Long Island City. 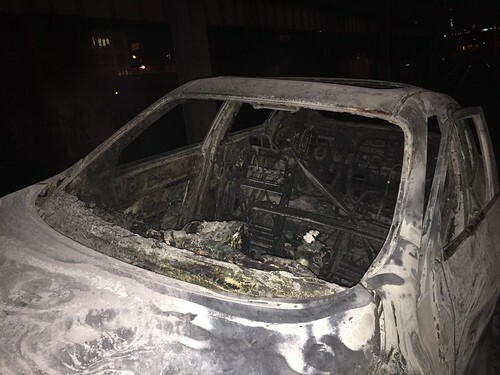 The MTA Police today announced the arrest of a 25 year-old Queens man who allegedly drove his car for a mile on the Long Island Rail Road tracks in Long Island City stopping only when his vehicle struck a third rail and burst into flames. Ronny Mora of Corona was apparently drunk when he entered the LIRR right of way at the Borden Ave. railroad crossing shortly after 11 p.m. and then drove the car on the tracks east for about three quarters of a mile, past the LIRR’s Hunterspoint Ave. Station, according to police. Police said Mora abandoned his car as it smoldered and finally caught fire walking back to the crossing where he told LIRR employees that he was “sorry” but had left his car on the tracks. The fire forced the Railroad to suspend service between Penn Station and Jamaica for nearly three hours while the New York City Fire Department extinguished the blaze and LIRR personnel repaired the damaged third rail. MTA Police said that Mora was charged with unlawful interference with a train, criminal mischief. Reckless endangerment, criminal trespassing, driving while intoxicated, reckless driving and leaving the scene of an accident. The best part is how he walked back to the crossing & just said “sorry” as if that was supposed to make it all okay. He should also be forced to pay for any costs that the MTA had to pay due to his idiocy. He should have his license permanently revoked as he clearly has zero business behiind the wheel!